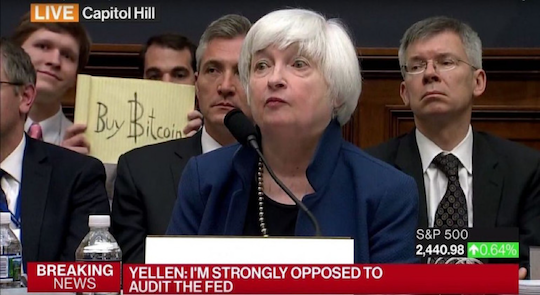 We must have glanced away at the moment someone photobombed Federal Reserve chairwoman Janet Yellen during her congressional testimony on Wednesday. As of a few hours ago, he’s netted about $16,000. Props for ingenuity, we say. But really, there are far easier ways to make money from cryptocurrencies than venturing to Washington, D.C., and doing a bit of performance art. 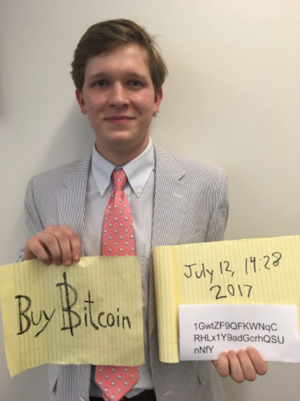 In fact, our research team recently discovered a way to get rich off Bitcoin that doesn’t require you to know a thing about blockchains or “mining” or “wallets.” All you need is $20 and the willingness to try something new. Follow this link and you ’ll see exactly what we’re getting at. To the markets… where a raft of sickly economic numbers has pushed up gold about 1%, to $1,230. They’re so weak that traders are sniffing out even more of an “easing” stance from the Federal Reserve than Yellen telegraphed two days ago. The dollar index has weakened to 95.2 — its lowest since early October — and finally dollar weakness is once again translating into gold strength. The major U.S. stock indexes are all in the green, but not by much. At 21,573, the Dow has added 20 points to yesterday’s record close. Earnings season is underway with three of the big four commercial banks reporting: Citi, JPMorgan Chase and Wells Fargo all beat expectations, but the details disappointed. All three are in the red this morning. Yesterday Jim Rickards told us how Yellen’s testimony this week signaled a policy flip-flop: After more than six months of steady increases in the benchmark fed funds rate, the process is now on hold. But wait, there’s more: Yellen also said the Fed’s “neutral level” for interest rates might be lower than previously thought. Zach explains: “The Fed’s ‘neutral level’ is the interest rate level where the Fed is not trying to boost the economy and is not trying to slow down the economy. Of course, this ‘neutral level’ is very subjective. But if the Fed believes the neutral level is low compared with its previous assessments, we can then expect the Fed to keep rates lower. Sorry to be the bearer of bad news. That said, if you’re looking for income and you’ve got $20,000 to invest, Zach has an excellent workaround. Fingers crossed, but it looks as if the next raid on Social Security is still a few years off. Or so we’d conclude from this year’s report just issued by the Social Security and Medicare trustees. We should rewind a bit: In 2015, the trust fund for Social Security disability — that’s separate from the one for retirees — was set to be exhausted within a year, forcing a 20% benefit cut. So when President Obama and House Speaker Paul Ryan hatched their “zombie budget” deal, they shored up Social Security disability by killing the file-and-suspend strategy many couples were using to maximize their old-age benefits. Doing so staved off the day of reckoning until 2022. Fast-forward to 2017 and the new trustees’ report says the day of reckoning has been pushed all the way back to 2028. Seems they expect fewer people to apply for disability — in large part because many people who might apply will have turned 62. That is, they can apply for early old-age benefits instead. So what about the old-age and survivors trust fund? The trustees’ latest estimate is that it will be exhausted in 2034, at which time benefits would have to be cut 25%. These estimates are always optimistic thanks to the funhouse-mirror accounting methods the trustees use. Usually, they make insanely high projections of economic growth to justify insanely high projections of incoming payroll tax revenue. Two years ago, they also figured on a 2034 time frame. But our own David Stockman said a more rational estimate was 2026. Given his capacity for truth-telling and his number crunching — he was Reagan’s budget director for five years — we take David at his word. As we mentioned earlier this week, Nevada’s first month of legal recreational cannabis is not going smoothly. The governor endorsed a “statement of emergency” issued by the Department of Taxation: There’s a dearth of licensed distributors because licenses are given only to existing alcohol distributors. (In other states, the dispensaries can transport the plant themselves; Nevada must have a mighty powerful booze lobby.) Thus there are shortages at the dispensaries. “Money talks,” says our penny pot stock maven Ray Blanco, “and Nevada has recognized that limited supply of pot is creating limited tax revenues. So yesterday the commission approved an emergency regulation change — allowing businesses other than booze wholesalers to obtain distribution licenses. Ray’s Nevada-based recommendation in Penny Pot Profits is up 200% in less than six weeks. And more opportunities like it are in the offing. The city’s cost of salaries and benefits has grown 33% over the last 10 years — a pace expected to continue five more years. The 5: Hey, the voters were doing only what the police unions and the teacher unions were asking them to do. It’s for the children! And safe streets! Who’s against that?! “You didn’t tell us who it was, actually, that purloined the Big Maple Leaf,” writes one of our regulars, teeing up one of our favorite punching bags. The 5: Under German law, the surnames of criminal suspects aren’t made public. But the state radio and TV outlet Deutsche Welle is nonetheless shedding new light on the giant gold coin caper. Because prosecutors say the suspects come “out of the circle of Arab clans,” it’s not a huge leap to speculate the perps hail from one of the city’s Lebanese mafia families. As for Corzine, whose status we last updated in January, he was spotted this week teaching summer semester at the British campus of New Jersey’s Fairleigh Dickinson University. Oh, there’s no potential for any funny business with that, now, is there? P.S. Here’s a marijuana milestone: Colorado has logged 12 straight months of sales topping $100 million. There’s no reason you can’t grab some of that growth for yourself. Start here.